Yokogawa Electric Corporation (TOKYO: 6841) announces that its Norwegian subsidiary, Yokogawa TechInvent AS, has received orders to provide 59 high-performance FluidCom chemical injection metering valves for two offshore oil fields that are being developed by Equinor ASA, a Norwegian energy company. One destination is the Johan Sverdrup field in the North Sea, 160 km west of Stavanger, and the other is the Johan Castberg field in the Barents Sea, 240 km northwest of Hammerfest. The orders for the FluidCom valves were placed through the suppliers of the chemical injection packages for these projects. The Johan Sverdrup field is estimated to have reserves of between 2.1 and 3.1 billion barrels, making it one of the five largest oil fields on the Norwegian continental shelf. Oil and gas from this field will be piped to separate onshore facilities. For the Johan Castberg field, which is estimated to have reserves of 450 to 650 million barrels, the plan is to use a floating production, storage and offloading (FPSO) vessel. The orders are for phase 2 of the Johan Sverdrup project and for the Johan Castberg project. Both projects are scheduled to start operation in 2022. Shigeyoshi Uehara, head of the IA Products & Service Business Headquarters, comments as follows about these two orders: "We believe that the selection of the FluidCom valve by Equinor, a company that is renowned for its advanced technology and leading role in efforts to achieve the Sustainable Development Goals (SDGs), was based on a very positive evaluation of its features. By enabling the remote control of chemical injection, FluidCom valves reduce the amount of work that must be performed under very demanding conditions on offshore platforms. Optimization of the chemical injection amount also protects the environment. FluidCom valves thus help our customers achieve significant reductions in OPEX and contribute to the achievement of the SDGs. By expanding its lineup of upstream solutions with products such as the FluidCom valve, Yokogawa is providing new value to its customers." Chemicals are injected into oil wells and pipelines to prevent scaling and corrosion. Although the opening, closing, and adjustment of injection valves is sometimes automated, this is usually done manually in the upstream sector. Such work is often performed under conditions that can be quite severe, and it can be difficult to avoid injecting excessive amounts of these costly chemicals. For reasons of safety, cost, and productivity, it is important to automate this process. Yokogawa TechInvent developed and sells the FluidCom chemical injection metering valve. 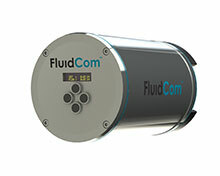 With flow metering and control functionality, a FluidCom valve can stably and automatically inject chemicals into a well or pipeline. The valve has few moving parts, so the risk of failure is low, and a self-cleaning function is provided that eliminates the need for maintenance. Suitable for both oil & gas upstream and midstream operations, the FluidCom valve improves operational efficiency, reduces running costs, and enhances health, safety, and the environment (HSE). Statoil AS (Statoil), a Norwegian national company, was renamed Equinor in 2018. Equinor is one of the world's largest oil and gas companies, covering from upstream to downstream: extraction, transportation, and sales of oil and natural gas. TechInvent AS, a venture business in Stavanger, Norway, set up TechInvent2 as a wholly-owned subsidiary in April 2017 to continue development and sales of FluidCom. Yokogawa acquired TechInvent2 in July 2017 as part of strengthening the upstream business. TechInvent2 was renamed Yokogawa TechInvent in August 2018. Press Release - July 21, 2017 "Yokogawa Acquires Norwegian Company with Advanced Chemical Injection Technology "
Founded in 1915, Yokogawa engages in broad-ranging activities in the areas of measurement, control, and information. The industrial automation business provides vital products, services, and solutions to a diverse range of process industries including oil, chemicals, natural gas, power, iron and steel, and pulp and paper. With the life innovation business the company aims to radically improve productivity across the pharmaceutical and food industry value chains. The test & measurement, aviation, and other businesses continue to provide essential instruments and equipment with industry-leading precision and reliability. Yokogawa co-innovates with its customers through a global network of 113 companies spanning 61 countries, generating US$3.8 billion in sales in FY2017. For more information, please visit www.yokogawa.com. The names of corporations, organizations, and products herein are either trademarks or registered trademarks of their respective holders.